Comparative Video 101: Print The Legend: "Remember The Alamo"
Print The Legend: "Remember The Alamo"
For fans of classic western movies, it just doesn't get better than John Ford's wonderful The Man Who Shot Liberty Valance. The film's components are hard to beat - what's not to love about John Wayne (in one of his absolutely best performances) playing Tom Doniphon, an upright tough guy who is reduced to alcoholism and failure by an act of self-sacrifice for the woman he loves, or James Stewart as Rance Stoddard, a good man corrupted into a false success by that selfsame act, or Lee Marvin as a villainous Valance who would be a comedic stereotype were he not so casually, psychotically, and believably evil? The film seems somehow perpetually relevant as well in its implied commentary on the nature of fame, especially in politics. Stoddard is retiring from a brilliantly successful political career as the movie ends - but a career based on a fundamental falsehood, one that contributes to the destruction of a better man than Stoddard will ever be. Liberty Valance is also notable for one of the great tag lines of any western of that or any era - the newspaper editor's comment that "When the legend becomes fact, print the legend." I'm always reminded of that line when I listen to what for many years was my second-favorite Kingston Trio song (after "Bay of Mexico"), the group's stirring performance of Jane Bowers' "Remember The Alamo," the last cut on the B side of At Large. The album's liner notes, as I recall, identified Bowers as a "proud Texan who knows much of Texas lore" - and it is the lore of the Battle of the Alamo that we get in this excellent song. Much, perhaps most, of what actually happened in San Antonio in February and early March of 1836 has been lost to history by neglect, personal and political agendas, and the simple passage of time. The motives of the defenders of the mission were not wholly pure (commander William B. Travis and perhaps a quarter of the Texians or Texicans were intent on creating Texas as a slave state in the Union, viewing an independent republic as only a temporary step), as many as a third of the garrison were Tejanos of Mexican descent, the garrison attempted to negotiate a surrender at least twice, and many of the casualties among the Mexican soldiers resulted from friendly fire because of the incredibly doltish plan of attack by General Antonio Lopez de Santa Anna, which called for simultaneous assaults from three sides causing his troops to fire into each other in volleys. Other cherished myths about the battle reflected in the Bowers' song also do not stand up to historical scrutiny - to wit: serious historians question whether or not Travis ever drew a line in the dirt with his sword (likely not), Bowie was probably unconscious and near death when bayoneted in his pallet (ouch) by Mexican soldiers who took him for a coward hiding from them, and Davy Crockett was 50 years old, alas! young neither then nor now. The highlights of this outstanding recording are IMHO first the arrangement (more on that below) and second Bob Shane's incredible rhythm guitar strumming, unmatched in any other version. Ritter's version, perhaps the first recorded, differs significantly in the chord structure of the accompaniment from the KT's. NBD replace the major chords that Ritter uses with some unexpected sharps and minors that create that flamenco-based sound in their version - very unusual for a banjo, BTW, and I think hugely more effective. Apparently Bob Dylan also recorded this, though I can't find a video of it. The cultural value of legends, of course, is that they codify the values and beliefs of the people who tell and believe in them. 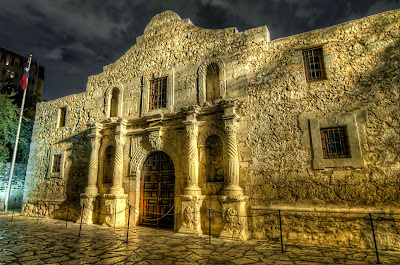 What actually happened at the Alamo and how one regards it is today something of a political Rorschach test, much as is the Battle of the Little Bighorn. But five decades ago, Jane Bowers and the Kingston Trio seemed more primarily concerned with honoring the mythic courage and sacrifice idealized in the song than in teaching a history lesson. They printed the legend, and did an up-and-walking good job of it. Thanks Millbrooker! I blush to say that I don't know of Otway - but I will be sure to look this version up! Comparative Video 101 is a resource for performance videos of some of the classic popular folk songs of the last several decades with personal commentary on them by Jim Moran, a teacher of literature for nearly forty years and a folk musician and writer for a decade longer. He is also co-host of the "Roots Music And Beyond" radio program on KPFK-FM in Los Angeles. Some of these posts appeared originally on the Kingston Crossroads message board, and many of the profiled songs were performed by the classic pop folk group the Kingston Trio. The page will be updated once or more per month. As of this writing in March of 2017, the Blogspot site that hosts CV101 has "deprecated" or made obsolete the old video code that I have been using since 2007 to make videos visible in these articles. That's ironic, since for several years Blogspot was not accepting the newer code that is now required, forcing me into a workaround that is now useless. The upshot is this. Of the 222 posted articles, more than 200 include multiple YT videos, up to ten but averaging about seven per post - more than 1400 videos in all. The change has left me with the choice of either abandoning this project, which at its inception in 2006 elsewhere was a kind of pioneer in presenting embedded videos with commentary - or going into every single article and changing the code for every single video. I hope that no one is surprised that I am choosing to do the latter. I do believe that there is some value in this site, and several hundred thousand people over the years have enjoyed it. However - changing all those codes is going to take some serious time to complete, so I beg your indulgence. If you happen by here and find an article that intrigues you but that is missing all or some of the videos, please drop a short comment at the end of the post and I will get to the restoration as soon as I can. As always, thanks for your attention to this project of mine. Use the Google Search Bar above as you would use the Google web search. Enter the name of a song or artist, press "search," and the results will appear showing every mention of your search term in the 150+ articles on this blog. An alphabetical index of song titles is coming soon; until then, the Google Search This Blog will substitute for it. A Terrible Beauty Is Born: "Roddy McCorley"
Since Blogspot/Google has recently begun including readership statistics as part of its service to bloggers like me, I have become aware that the readership for these pages is far more extensive and international than I had ever dreamed, usually approaching 1,000 visitors per week from literally all around the world. I am profoundly appreciative of the interest in these posts and glad that folk music fans find enjoyment and value in them. There are currently more than two hundred articles here, and nearly all of the twelve hundred posted videos in those articles are from YouTube. Most readers will already know that because YouTube is another subsidiary of Google, the latter company is being sued for copyright infringement by a significant number of content providers like Sony-BMG and Warner's Music Group. YouTube/Google's normal response to infringement claims is to remove the disputed videos or ban them from certain countries in which the claims have been filed. This, of course, has a profound effect on the content of posts like the ones in this blog. Videos that I have selected for any given article can be and often have been removed at any time without warning. I try where possible to replace deleted videos with other versions of the same performance or with similar renditions of the songs, though this is not always possible. Policing the hundred plus posts to be sure that there are interesting and representative video performances is itself a major undertaking, one that involves a significant commitment of time. I hope that those of you good enough to stop by this blog will have a bit of patience. I review as many of the older articles as I can every week with the goal of maintaining the integrity of each, and sometimes this enables me to find newer, better, and more exciting performances of the songs profiled here. Once again, thanks for the interest!